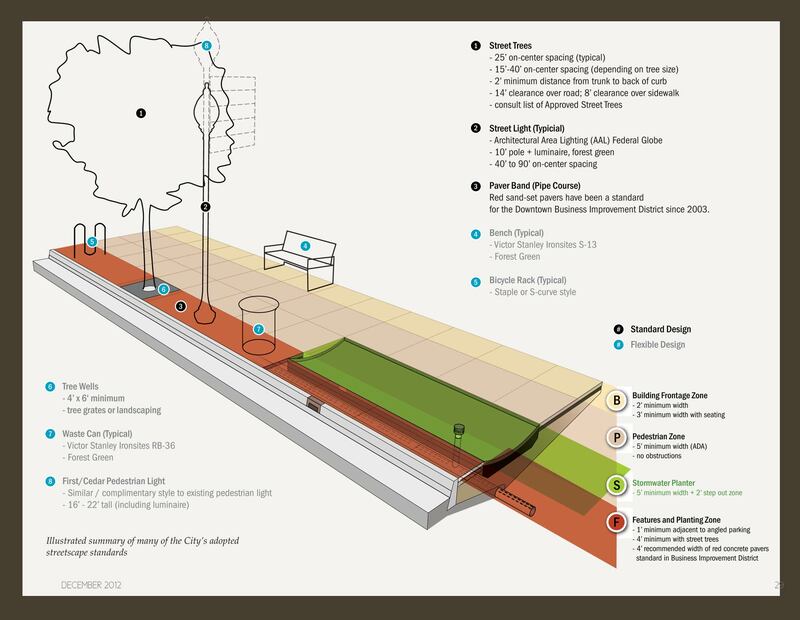 In Downtown, and particularly on First Avenue and Cedar Street, foundational streetscape elements like sidewalks, lighting, street trees, stormwater facilities, and informational /wayfinding signage, should be simple, elegant, consistent throughout the Downtown, and should harmonize with the historic architecture and previous streetscape investments. Additive streetscape elements – like banners, benches, waste cans, public art, seat walls, kiosks, etc., can be more whimsical and should introduce a more artistic character to the public realm. Buildings can also influence the artistic character of the community with wall murals, facade improvements, and alley art. Pedestrian-scale lighting is one of the most significant and important investments the City has made in the last decade. The City’s standard light pole a 10-foot tall, fluted steel pole that has been custom polyester powder-coated in forest green. The luminaire is a traditional “Federal Globe” acorn-style lamp and has been outfitted with an internal cut-off to comply with the City’s “Dark Sky” ordinance. The light pole is manufactured by Architectural Area Lighting (AAL). This light pole complements the Downtown’s charming historic character and will continue to be used on all of the internal streets in the Business Improvement District. 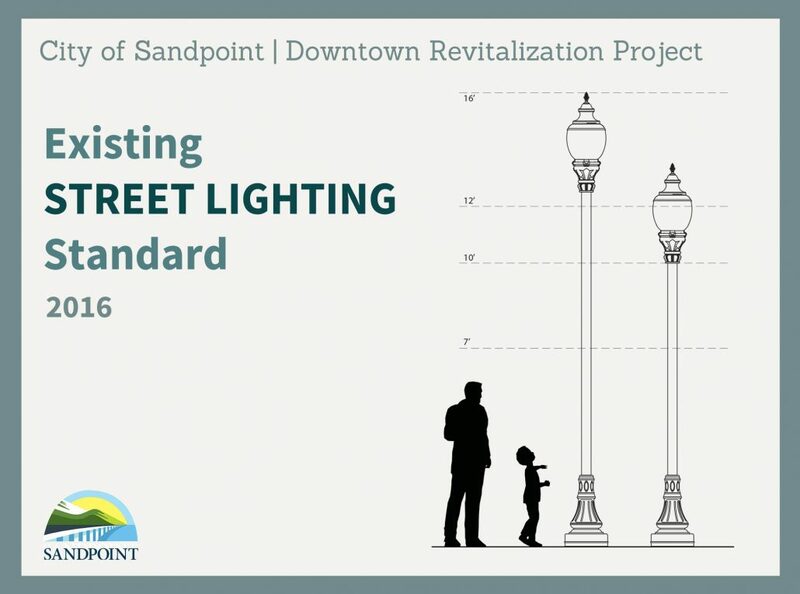 A complementary, but taller (14-foot minimum, 16-foot preferred), light pole may be considered for the First Avenue and Cedar Street streetscape. The taller light pole allows banners, art, and flower baskets to be hung from the pole at a height that is easy to see at a distance and provides better vehicle clearance.